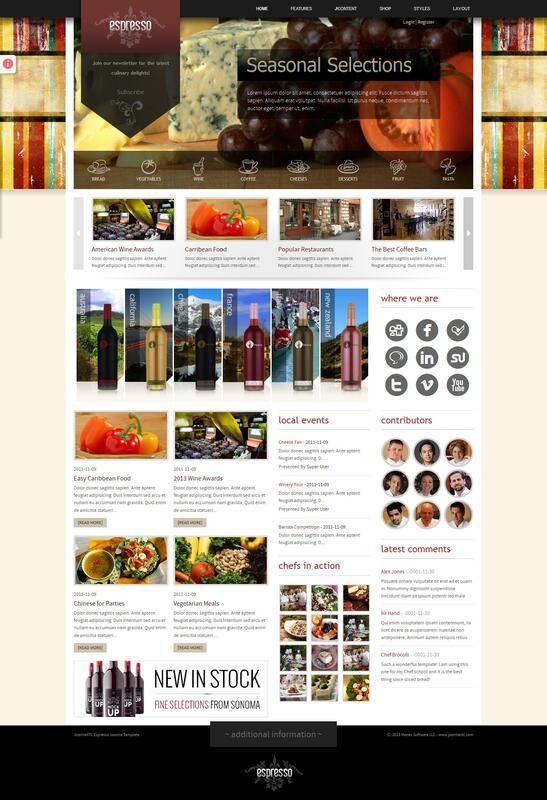 JXTC Espresso - functional template restaurant themes from popular developers JoomlaXTC. This template has a number of advantages, allowing to create a professional and modern website. Original design template contains 6 unique built-in styles, which will provide an attractive appearance to any site. Template designed based on advanced web - technology and therefore looks very impressive on any devices, and screens. Using CSS3 features allowed to achieve a better animation and visual effects presented in the template. A key feature of Espresso! is full support for popular third-party extensions: AcyMailing, K2, K2store, Komento, Kunena Virtuemart and with which you can create not only a business card or a portal site, but also an online store. JXTC Espresso! perfectly optimized, has a responsive design and progressive download of images.